Place all given pieces into the grid without overlapping each other. Pieces cannot be rotated or reflected. Then place the letters so that the grid satisfies Easy as ABC rules. In other words, in every rows and columns, there are the letters in the given range exactly once. And letters outside the grid show the nearest letter in that row or column. This puzzle is broken variant of Easy as ABC. 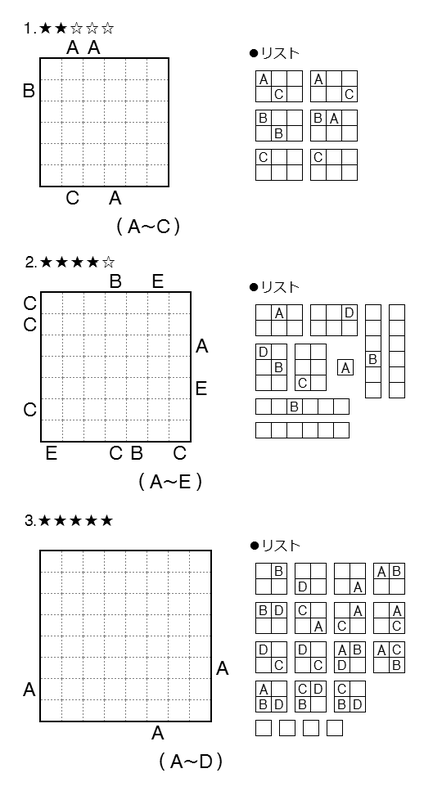 This rule is based on 15th Japan Puzzle Championship Internet Preliminary Test(*1). Originally, all letters are shown on the pieces. Hidden letters are my arrange. Similar concept puzzles are made on several occasions. These used dominoes as pieces(*2)(*3)(*4). These puzzles are difficult than usual. Especially #3 though not try and error logic. Be careful! *1 第15回全日本パズル選手権インターネット予選, 8. 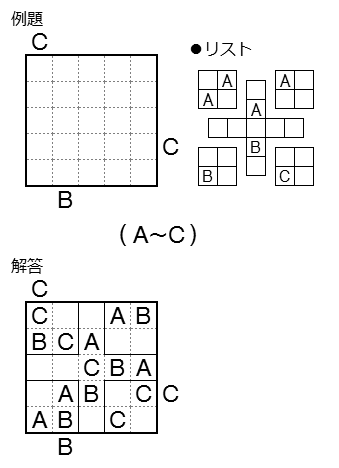 ジグソーＡＢＣプレース, 2006. *2 Andrei Bogdanov , IPST 2004-2, 5. Easy as Dominoes, 2004. *3 Nikola Zivanovic, 8th 24hours Puzzle Championship, 12. EASY AS DOMINO, 2007. *4 Roland & Ulrich Voigt, 10th 24hours Puzzle Championship, 10. Easy as ABCD with Dominoes, 2009.